The telecommunications giant AT&T stepped into the home security and automation market in 2012. Since that time, it has garnered market share mostly through customers who were satisfied with AT&T’s mobile phone, broadband internet, and broadcast television services. AT&T Digital Life home security systems consist of wireless equipment, professional alarm monitoring and remote access system control. Here’s a look at the three plans that the company offers going into 2019. 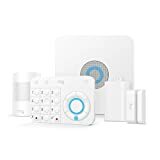 AT&T Digital Life’s base-level home security plan, Smart Security, comes with one indoor alarm, keypad, and motion sensor. It also includes a set of four window/door sensors and two recessed contact sensors. The system is watched by UL-listed monitors, who dispatch emergency personnel or police to homes within five minutes of a triggered alarm. Installation of new or like-new equipment is included in the plan’s price. AT&T reserves the right to give customers refurbished equipment to keep their prices low. The Smart Security plan is $39.99 per month, and its upfront equipment fee is $349.99. The intermediate-level AT&T Digital Life home security plan, Smart Security and Automation, includes all the equipment in the base plan plus some added system capabilities. This plan’s users can view live and recorded video from system cameras on their smartphones, and they can lock doors remotely. Three additional window sensors, an outdoor camera and a keyless door lock are pieces of extra equipment that are included in this upgraded plan. The monthly cost for the Smart Security and Automation plan is $54.99, and its initial equipment cost is $549.99. AT&T Digital Life’s highest-level plan, Premium Security and Automation, comes with all the functionality of the intermediate plan but with extra home automation features. AT&T uses a Z-Wave network that is similar to the one that is used by Protect America to control its smart home security equipment from any location. With the Premium Security and Automation plan, users can remotely control thermostat settings, lamps, and other small appliances. The system offers added safety and home protection elements such as moisture, carbon monoxide, temperature, and glass-break detection. It comes with three more window/door sensors than the Smart Security and Automation plan. The Premium Security and Automation plan costs $64.99 per month, and its equipment has a $849.99 price tag attached. All AT&T Digital Life home security plans require two-year contracts upon a satisfactory credit check. High-speed internet is also needed for system operation and monitoring. One AT&T Digital Life customer pointed out that her family’s security system worked fine until her area experienced a power outage. Many people don’t realize the impact of inclement weather on broadband internet. However, network specialist at Bandwidth Place, Doug Banderud, points out the risks to internet service during powerful storms. However, AT&T’s new and used equipment that runs between $349.99 and $849.99 appears overpriced compared to the $1400 worth of equipment that Protect America includes for free in its $19.99 per month, 36-month contract plan. AT&T Digital Life is currently available in 34 states. If a person has to move to a state that isn’t supported by Digital Life, he or she will have to pay heavy cancellation fees. Even if the person moves to a supported area, the AT&T Digital Life website indicates that he or she will have to pay some fees to transfer the service. Protect America serves customers throughout the United States, and it offers a free relocation kit to its clients who must move out of state. If you’re ready for a high-performance home security system in 2019 that can move with you, contact the representatives at Protect America today.